During the summer, and other common vacation periods, staff and volunteers may need to adjust the time they serve at your agency. You want to ensure that your calendar is up-to-date with all changes and the following iCarol features are there to assist. If a volunteer or staff member has already signed up for or been assigned to a shift, but realizes that they cannot serve the shift, they can un-register from the shift. To do so, the volunteer or staff member will use the shifts area of iCarol to navigate to the day of their shift, and will click on their name in the list of shifts. A pink box will appear to the right, and in that box, there is an “Unregister” button which they should click. 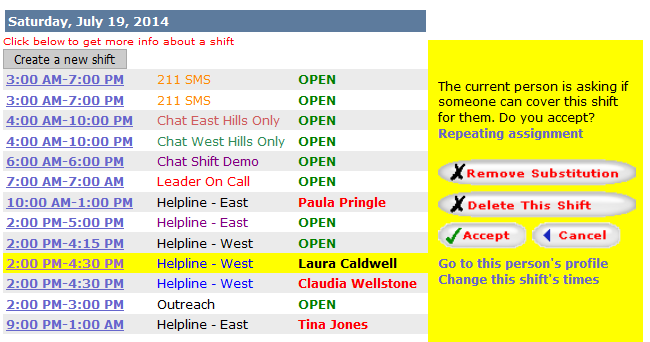 Clicking this button will remove the person’s name from the shift, and it will revert to an “Open” shift so someone else can sign up for it. This feature is similar to the “Unregister a shift” feature, but goes an extra step and facilitates the coverage for shift assignment changes. If a volunteer or staff member has already signed up for or been assigned to a shift, but realizes that they cannot serve the shift, they can ask for a substitution. 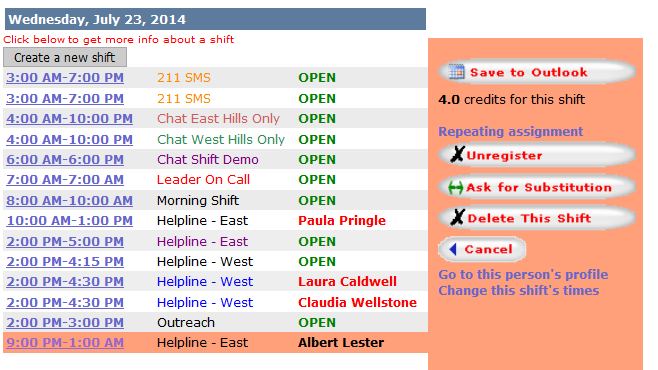 To do so, the volunteer or staff member will use the shifts area of iCarol to navigate to the day of their shift, and will click on their name in the list of shifts. A pink box will appear to the right, and in that box, there is an “Ask for Substitution” button which they should click. Clicking this button will send an email to all users indicating that the volunteer or staff person is looking for a substitute, and will highlight the shift in yellow so it is easily spotted. If someone would like to substitute, they would navigate to this shift in the Shifts area of iCarol, and click the Accept button. Whether or not you allow un-registration or shift substitutions, and how soon before the start of a shift a person can unregister or ask for a substitution, are settings Admin’s can control via the Shifts tab in Admin Tools. If you have members that are assigned to the same shift over a period of time, the repeating assignment is a great tool to use. This tool allows you to collectively schedule those repeating assignments and it also handles exceptions, such as to remove the person from the shift during a particular time span when they will be on vacation. 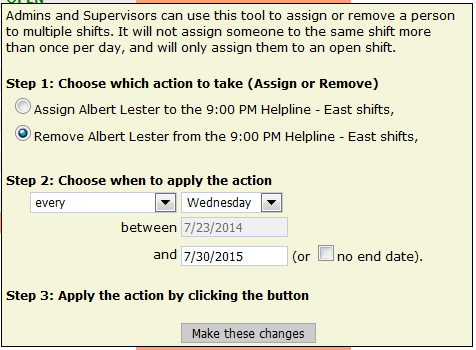 To do so, use the shifts area of iCarol to navigate to the first shift within a repeating shift assignment that they would like to unregister for and click on their name. A pink box will appear to the right, and in that box, there is a link labelled “Repeating assignment” which they should click. Firstly, the volunteer or staff person should click the radio button next to “Remove”. Next, using the drop-down boxes, they should indicate what time frame (every, every other, each month’s first, etc.) and what day of the week they would like to be removed from. 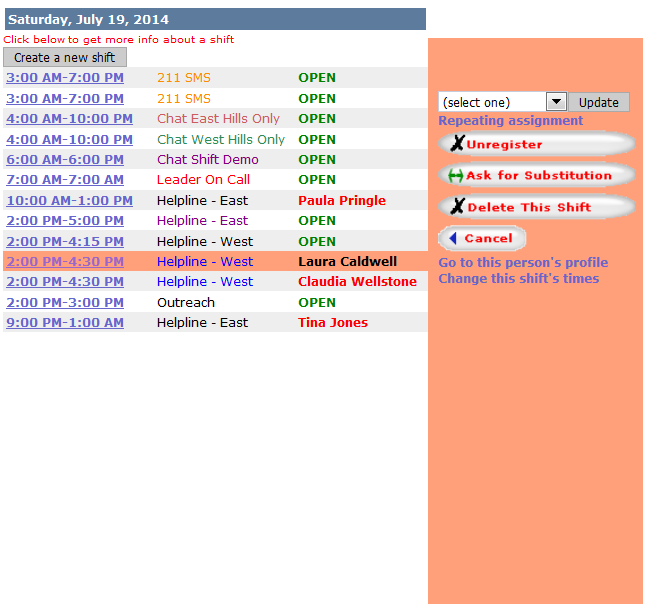 The date next to “between” will be defaulted to the date of the shift the volunteer or staff person is adjusting. The volunteer or staff person should adjust the date next to “and”, or check the box next to “no end date” to remove themselves from every shift into the future. Finally, they should click the “Make these changes” button. If you have any questions about these tools, please do not hesitate to submit a case to the support team via the online case management tool, found in the Help menu in iCarol.